Hannah loves gorillas, but she’s never seen a real one. Her dad is always too busy to take her to the zoo, or anywhere, for that matter. As Hannah’s birthday nears, she dares to hope that things might change. When she finds a toy gorilla inside the birthday wrapping at the end of her bed in the middle of the night, Hannah throws the disappointing toy in a corner and that is when magic happens. Hannah’s longing to spend time with her father is embedded within every page of her fantastic night-time adventure, just as gorillas were present on each page leading up to her birthday. The circular notion of beginnings, endings and what happens in between adds to the dream-like feel of Gorilla. 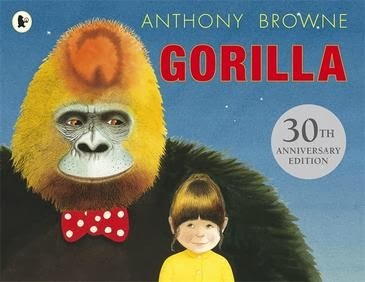 On the other hand, Anthony Browne’s detailed illustrations of primates are so lifelike that their fur looks touchable. I was tempted to try and tickle the monkey’s whiskers and the orang-utan was definitely huggable. A gentle wisdom awaits in Gorilla as well as some very lifelike primates. Those who love tales about family and relationships will treasure Gorilla, as will animal lovers.